The Village of Wonder Lake is a rapidly growing community. It is currently made up of the following subdivisions around Wonder Lake: Deep Springs Woods I, Deerpath, Hickory Falls I, Hickory Falls II, Lookout Point Unit I, Shore Hills, Sunrise Ridge, Sunrise Ridge Estates, The Meadows of West Bay, White Oaks Bay, Wooded Shores, Woods Creek, and a portion of Wonderview. The Village was incorporated in 1974 as the Village of Sunrise Ridge. 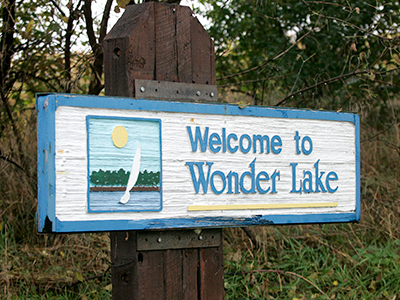 The name was later changed to the Village of Wonder Lake.